Earn $10.94 in VIP credit (1094 points)What's This? 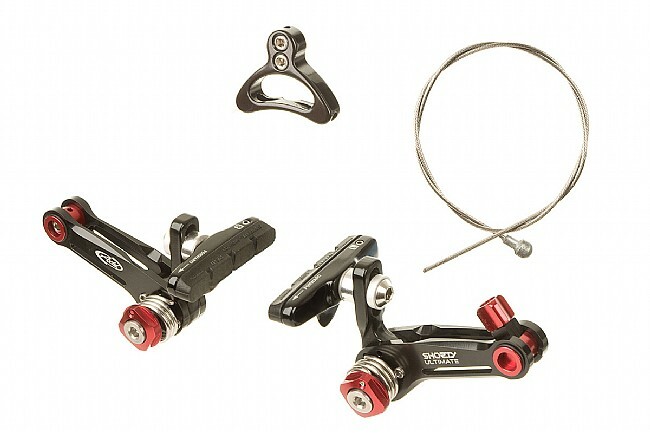 Avid has perfected the cyclocross brakeset with the new Shorty Ultimate Shorty Cantilevers. This 2011 design is as functional as it is attractive, with two preset arm configurations allowing riders to choose between wide or narrow stance. The narrow stance model provides greater stopping power and won't catch legs during dismounts/remounts (it also doesn't interfere with the rear rack on your touring bike), while the wide stance version offers the massive mud clearance needed for the most demanding 'cross conditions. Most prefer the wide stance version up front, and the narrow stance in the rear, but these brakes can be run in any configuration. The new Shorty Ultimate is also equipped with an in-line cable adjuster and a quick release for superior adjustability. The arm width can also be adjusted to accommodate varying fork designs, and each brake comes with standard road cartridge pads for hassle-free replacement. Aluminum arm construction with Black anodized finish and Red accents. Sold individually in either the Wide (Front) or Narrow (Rear) versions. 115 grams each. I bought this brake for a single speed, cyclocross race bike build. 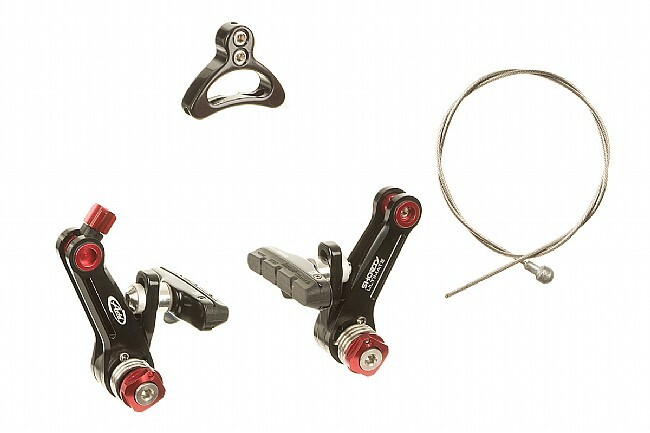 Im a big fan of the mechanical advantage canti brakes offer, and these are no exception. They are the most straight forward canti brakes Ive installed, though still take a little tweaking to get buttery smooth. They look great, shes mud, and an under rated version of these is that they use regular road brake pads. That equals less money and ease of use when it comes to maintaining them. Yes, they are priceier compared to other brakes, but that price is justified in its stopping power and ease of set up (less trips to the LBS). When stopping matters, this stops on a dime. I disliked these when I opened the package 4 years ago. I hate them now, and here's why. 2. the little washers between the bosses and the tension adjusters...you lose'em, you're screwed. 4.the straddle cable holders are held in place with O rings. How long they last? I did like the quick release set-up, but that's it. I went back to Oryx's, which work just as well. I just started racing CX, and was unpleasantly surprised at how pathetic canti brakes were, or at least the stock pair that came with my low-end CX bike. I upgraded the front to the Avid Shorty because it seemed like most of the pictures I saw in the magazines showed them on the pro's bikes. They are definitely more powerful and a good bit lighter. Their adjustability lets you dial them in exactly the way you want. The only complaint I have is the style of pad keeper, which is a bit of a pain to use compared to the simple screw used on most road bikes. Still, a worthwhile upgrade if you're sticking with cantis. This is easily the best cantilever brake I've ever ridden. It's VERY easy to set up, as long as you have the right tools. Add to that, the braking power and modulation are both very good, largely, I would assume, because of the stiffness of the system. It only requires a tiny bit of toe-in to stop the canti squeal, maybe a credit card width. All that said, it's expensive, but after years of awful and mediocre cantilevers, I'm glad to say I've found one I can say is actually worth the money. Tools needed You'll need 6 separate tools to set it up - 2.5mm, 3mm and 4mm hex wrenches, a torx T10 (if you want to change the arm width), a 15mm wrench (seems it was designed with the park tool cone wrench in mind), and of course, a cable cutter. I believe that's double the one I took off to replace.